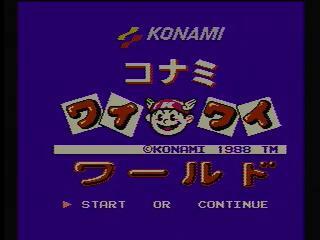 Released in 1988 for the Famicom, Konami Wai Wai World is Konami rolling in its own glory in its early years. Featuring a cast of characters including Simon Belmont, Mikey from the Goonies, Goemon, King Kong, Fuuma, and a Moai head from Gradius (well, really Moai-kun, but 99% of people will think Gradius) as well as Konami's two ill-fated mascots, Konami Man and Konami Girl and a host of other cameos, this games really a Konami fanboy's dream come true. Best time: Single-segment 0:33:25 by Josh 'Funkdoc' Ballard on 2011-07-20. This was one of the first Japan-only games I discovered through emulation, and I've had a soft spot for it ever since (even making the first TAS of it back in 2004). It's got Simon Belmont teaming up with King Kong, a Gradius Moai head, and Mikey from The Goonies - what more could you want? The story behind this one is a bit unique. Dogma Kazami is a Japanese streamer famous for struggling through really hard and/or obscure retro games, and since Ghosts ‘n Goblins is one of his all-time favorites he eventually discovered Kareshi's speedrun of it. He contacted Kareshi about appearing on his stream, and from there Kareshi showed him Pianovania from the first AGDQ. Since the original Castlevania is another Dogma favorite, he asked me to speedrun that game on his stream; even though it was a bad run by my standards, the audience was amazed by it. Dogma then asked Kareshi and me to appear on a 24-hour stream of his, with Kareshi playing piano and me attempting to break the world record on Wai Wai World. Dogma had just recently played through that game on his stream, and with my Konami background he figured I could do it. He gave me an AV Famicom (well, actually two... we didn't know about the effects of the NES power supply) and Wai Wai World (along with a couple other games), and I went about learning it during the summer. Initially I could not get close to the world record, as I was basing the strategy on my old single-player TAS, and I asked Dogma and his English-speaking friend DB-Kai for help. They pointed me to an archived run by SaboP (the WR holder), and then everything made sense to me. Long story short, I beat the WR handily on my first try on Dogma's stream. However, I played a bit conservatively there and had found a more luck-based strategy that could shave off even more time, so after the stream I went to work on recording a run for SDA. The result is what you see here, and now it's time to explain it all! The overall goal of this route is to obtain the Gradius power-up icon ASAP. This item permanently doubles everyone's attack power, but it requires the cape (which allows Konami Man & Konami Girl to fly). I get Simon first because the cross is awesome and I need another body for the Goonies stage, I get Mikey next because you need him to fit through some of the passages in Kong's stage, I get Kong because his high jump is needed to complete the Getsu Fuumaden stage, and that stage is where you finally get the cape. Fuuma's (yes, the guy in CVHD) ability to break blocks is also necessary for Moai's stage. As for the characters themselves, Konami Man & Konami Girl can fly but aren't amazing otherwise (well, Konami Girl's attack range is pretty good). Mikey is just a meat shield aside from Kong's stage, and Goemon is always a meat shield. Fuuma is in a similar position to Mikey's though he has the triple shuriken. Moai is the best meat shield since he has higher defense than the other characters. Simon and Kong are the two that matter the most - Kong deals the most damage to normal enemies (and one boss), while Simon's cross is a must for all of the other bosses. A lot of running this game comes down to planning out your damage and managing everyone's lifebars at once, as this game's challenge mostly lies in cheap hits. Bullets are the ammo for special weapons. Most of these cost 1 bullet each, but the cross takes 5 and the shuriken take 3. Just as importantly, it costs 100 bullets to revive a character. Speaking of revival, entering Dr. Cinnamon's room fully heals your party. This game has a few clever speed tricks. You can hit enemies then walk through them to avoid damage - sometimes you'll even gain invincibility as if you got hit but not take any damage. Switching from Mikey to another character in tight passages at the right points can boost you forward slightly. All stages except for Kong's and the last level have a hidden exit teleporter somewhere, though I end up not using Fuuma's. If you jump next to a wall with a smaller character then switch to Kong or Moai, you get stuck inside the wall and can jump again - effectively a walljump glitch! The techniques I learned from SaboP are by far the biggest timesavers, however. These all involve some form of death abuse. Normally in Mikey's stage, you have to backtrack a long way after picking up the key, but killing a character takes you back to the start of the room (i.e. the ledge you fell from) and cuts out most of that. After picking up the key in Kong's stage, it saves time to input a code (Up+A+B+Select) to kill a character and warp back to the beginning of the boss room. He also uses this code to kill all of his characters after rescuing Fuuma and warp out of the level; this costs you half your bullets and leaves you with only Konami Man and Konami Girl alive, but the next stage has a slot machine which can be manipulated (via pausing) to revive the entire party. I use all of these but add a new and much more luck-reliant deathwarp. I make a slight detour in Castlevania for a 100-bullet pickup, then in the Goonies stage I play a dice game that doubles your bullets with each win and halves them with each loss. Winning twice here gives me enough bullets to revive Konami Man after this stage, kill everyone to deathwarp out of Kong's stage, then revive Simon and Kong for Fuuma's stage! These tricks are the reason this run is faster than my old TAS. Given all of this, the stages themselves don't need much description. Kong's is the roughest since you're supposed to also have Goemon there, Moai's is nasty until you figure out how to deal with the dragons, and the last level isn't too bad but requires precise planning and switching. During the dragon corridor in Moai's stage, I pick up an item called the Rice Ball. This automatically revives a dead character once, and I need it to keep Simon alive for the final boss. Speaking of bosses, most of them are pretty simple but a couple need explaining. The Moai boss has a smaller hitbox than the others and tends to jump around a lot, so the cross isn't that effective and Kong ends up being the better option. The final boss needs some luck for the fastest kill, as you have to get some health drops to keep Simon alive even with the Rice Ball; this is why I vary the timing on my crosses, to constantly hit the boss while also taking out the enemies behind me. Overall I am highly pleased with this run. Oddly enough the shmup stage had the biggest mistake and that was still just a few seconds. Thanks to SDA and SRL, Dogma/DB-Kai/Kareshi for the great opportunity, Dogma again for the Famicom and games (and dogbone controllers! ), SaboP for showing me the missing piece of the puzzle and supporting the 24-hour stream, and all my stream viewers for the support and fun times! If you're interested in more speedruns of obscure and classic retro games, follow my stream at http://www.twitch.tv/srkfunkdoc !